The protein encoded by this gene is a member of the superfamily of ATP-binding cassette (ABC) transporters. ABC proteins transport various molecules across extra- and intra-cellular membranes. ABC genes are divided into seven distinct subfamilies (ABC1, MDR/TAP, MRP, ALD, OABP, GCN20, White). This protein is a member of the MRP subfamily which is involved in multi-drug resistance. This protein functions in the cellular export of its substrate, cyclic nucleotides. This export contributes to the degradation of phosphodiesterases and possibly an elimination pathway for cyclic nucleotides. Studies show that this protein provides resistance to thiopurine anticancer drugs, 6-mercatopurine and thioguanine, and the anti-HIV drug 9-(2-phosphonylmethoxyethyl)adenine. This protein may be involved in resistance to thiopurines in acute lymphoblastic leukemia and antiretroviral nucleoside analogs in HIV-infected patients. Alternative splicing results in multiple transcript variants. Western blot analysis of extracts of HeLa cells, using ABCC5 antibody at 1:1000 dilution. 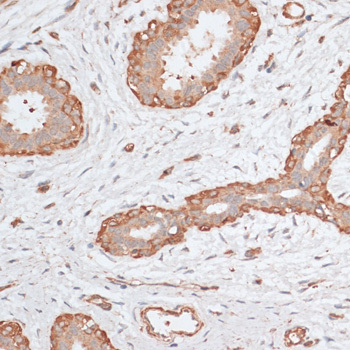 Immunohistochemistry of paraffin-embedded human breast cancer using ABCC5 antibody at dilution of 1:100 (40x lens). 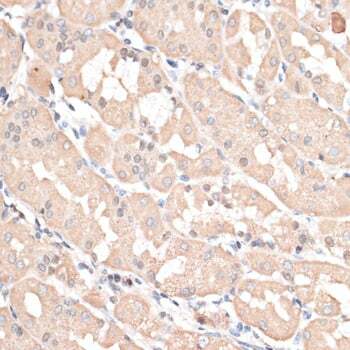 Immunohistochemistry of paraffin-embedded human stomach using ABCC5 antibody at dilution of 1:100 (40x lens). 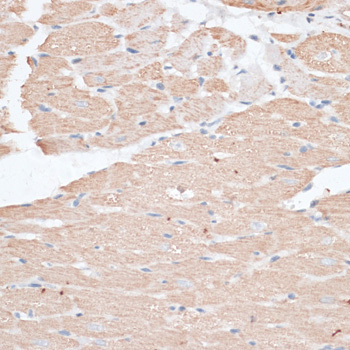 Immunohistochemistry of paraffin-embedded rat heart using ABCC5 antibody at dilution of 1:100 (40x lens). 1. our work indicated that decreased SLC34A2 expression sensitized BCSCs to doxorubicin via SLC34A2-Bmi1-ABCC5 signaling and shed new light on understanding the mechanism of chemoresistance in BCSCs. This study not only bridges the missing link between stem cell-related transcription factor (Bmi1) and ABC transporter (ABCC5) but also contributes to development of potential therapeutics against breast cancer.